Berks County Courthouse is located at 633 Court Street, Reading PA 19601; phone: 610-478-6100. Photo: City of Reading downtown as viewed from The Pagoda, Summer, 2009. Berks County is an urban area of 373,638 persons (2000 Census), situated in southeastern Pennsylvania. The county seat, which is the city of Reading, is 56 miles northwest of Philadelphia and the heart of the Delaware Valley region, which is one of the leading industrial and trade complexes in the nation. Schuylkill County borders the County on the north, on the west by Lebanon and Lancaster Counties, on the east by Lehigh County, and on the south by Chester and Montgomery Counties. Despite its closeness to the Philadelphia metropolitan area, it is considered part of Pennsylvania's Dutch Country. (source: Berks County Pennsylvania, Economic Resource Profile). Through numerous federal and state highways and turnpikes, the County is linked to other major cities such as New York (125 miles) and Baltimore (97 miles). The County is a diamond-shaped area of 864 square miles. Sections of the Blue and South Mountains, two ridges of the Appalachian Mountain chain, form its northern and southern boundaries with elevations averaging about 640 feet above sea level. The Schuylkill River and several of its main tributaries drain almost the entire county. The mean annual temperature is 54.3 degrees Fahrenheit. The fall and winter average is 38.9 degrees; the spring and summer average is 74.8 degrees. Average annual rainfall is 41.4 inches, and average annual snowfall is 30.6 inches. Berks is a county rich in history, scenic and natural resources. These assets are a result of the diverse physiographic regions that are present in the county, including the Blue Mountain and Great Valley regions of the Valley & Ridge Province, the Reading Prong region of the New England Province, and the Triassic Lowland of the Piedmont Province. The four regions support a variety of topography, soils, vegetation, wildlife, water resources, and scenery. The Blue Mountain forms the northern boundary of the County. It was a barrier to migration during the pioneer settlement of the State, as well as the limit of the earliest surveys northwestwardly from Philadelphia. Within the County to this day, it is pierced only at Schuylkill Gap, above Hamburg, and is crossed by four other roads. The South Mountain ridge reaches elevations between 800 and 1200 feet above sea level and enters the County from the west, south of Route 422, and extends in two directions through Berks County. One ridge extends southeast along the south side of the Schuylkill River. The primary ridge encircles Reading and then extends northeast into Lehigh County, forming the Reading Prong. North and west of Boyertown, this range has a width of 12 - 18 miles and reaches elevations between 800 and 1200 feet above sea level. Extending the entire width of the County between the Blue and South Mountains is a section of the Great Valley. A limestone section of the Great Valley is predominantly rolling farmland, containing rich agricultural soil with elevations of 200 - 500 feet above sea level. The shale section of the Great Valley, occupying higher elevations between 400 - 800 feet above sea level, is located next to the Blue Mountain. The Piedmont Lowlands are located in the southernmost part of the County and are composed of lower mountains and rolling hills. The Great Valley does not form the main drainage channel, but is crossed at a right angle by the Schuylkill River on its way to the Delaware River. Numerous smaller valleys are associated with the Schuylkill River and its tributaries. The Northeastern portion of the County drain into the Lehigh River and eventually the Delaware River, while tiny portions of southwestern and extreme western Berks drain into the Susquehanna River Basin. At the start of the Eighteenth Century, the mild climate, fertile soil, and the Schuylkill River combined to attract European immigrants to Berks County. The area was originally settled by Swedes in 1701, followed by Germans, English, Welsh, and French Huguenots. Most of the County's eastern section was settled by people migrating inland from the Philadelphia area. In 1752, Berks County was incorporated from parts of Lancaster, Chester, and Philadelphia Counties. In 1772, Berks gave up territory for the formation of Northumberland County, and again in 1811, for the formation of Schuylkill County. 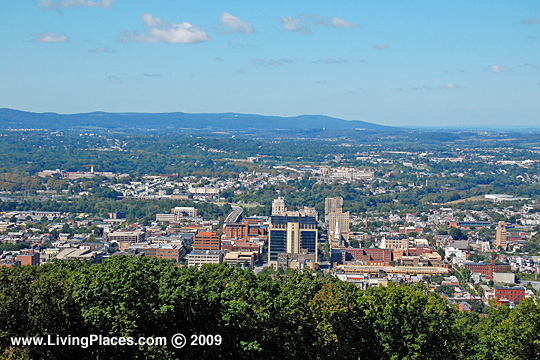 Berks County was named for Berkshire, England, home of William Penn's family. Likewise, Reading was named after the main town in Berkshire, England. In 1790, the first federal census of the county reported 30,189 residents, 22,345 of whom were of German descent. Reading Town, the only sizable settlement, had 2,225 residents. Reading's early growth was largely influenced by the Schuylkill River, which made navigation of flat-bottom boats possible to carry products, mainly agricultural to the markets of Philadelphia, and later by the County's early lead in steam railroad growth. Reading's industrial complex attracted a considerable amount of immigrant labor during the late 19th and early 20th centuries, an era of great industrial growth for Berks County. At one time, it was the largest manufacturer of full-fashioned hosiery in the world. Since 1900, the County's population has more than doubled, with concentrated development in the City, its urban area, and the larger rural boroughs. In 1951, Berks County became a third class county. Recently, with increased mobility and changes in land utilization, a development pattern reflects continued suburban growth outward from Reading, as well as development in rural land beyond the suburban areas in the direction of Philadelphia, Allentown, and Lancaster. Growth trends in the past several decades indicate that the County should continue to grow at a moderate rate. It is the County's goal to promote a more consolidated development pattern instead of the scattered pattern currently occurring. New growth is encouraged to occur within natural service areas of existing and proposed public water and sewer systems, where higher densities and greater variety can be provided.